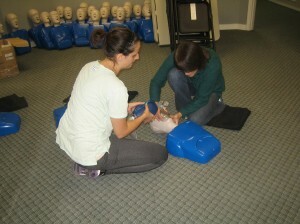 American CPR courses are the most popular healthcare-related training programs in the US today. With emergencies and disasters happening left and right with no warning, people have started to become prepared when it comes to CPR. Cardiovascular programs like heart attacks and strokes are one of the leading causes of mortality in the country – a rate that is greatly affected by the ability of the public to give CPR to a victim of cardiac arrest. A few minutes or seconds of CPR can help save someone’s life. CPR is made up of different skills such as chest compressions and rescue breathing. To help make CPR easier for trainees to understand, the American Heart Association (AHA) came up with a series of steps called the “Chain of Survival”. The chain is made up for five links that a rescuer is supposed to follow when giving CPR. Recognition that cardiac arrest has occured – A rescuer has to surmise that a person has experienced cardiac arrest before starting CPR. This means that he or she has to position the victim flat on the ground, check for pulse, and check for regular respiration. If there is no pulse, CPR is started immediately. Gasping is not considered regular respiration. Starting CPR immediately – Once cardiac arrest has been determined, chest compressions are immediately started. 30 chest compressions are given followed by two rescue breaths. This is repeated until emergency medical help arrives or the victim is brought to the hospital. Defibrillation – If there is an AED (automated external defibrillator) available, it is attached to the victim if the victim experiences irregular heart rhythms. Electrical shock is sent from the machine to the victims heart to try and get the cardiac rhythm stabilized. There are five training classes available with our providers. Three are under Basic Life Support training and the rest are under Advanced Life Support training. Basic Life Support is about managing a victim of cardiac arrest before emergency medical help arrives. Advanced Life Support is about managing a victim in a clinical setting, typically taken by healthcare providers such as EMTs and nurses. Students need to pass the post-test (a skills and written test) to get certified. The credentials are valid for two years; they can be renewed through a re-certification class before they expire. Expired certification cannot be renewed.